THE PROBLEM: Problems found in the new interface were that the conversion of search to buy was rather low due to lack of user trust of the seller. With new user trends and tech innovation on the rise, our problem was to redesign a smoother user flow which provided more user trust, while maintaining Craigslist’s simple entity. SOLUTION: By exploring other platforms of online ad services, such as Letgo and Offerup, we have found that many other online ad systems utilize user profiles to dictate interactions between users. Craigslist’s current user interface provides contacting methods that is determined by the poster: either a random email link is generated by Craigslist in which the user can reply to, or the poster could provide their phone number randomly in the ad. Based on these methods, we have found that many users are apprehensive to reply to these ads because they don’t trust the source of contact. To provide more trust, an in-desktop profile messaging system will be a main concept of the redesign. We will also focus on a simple refresh on the homepage and streamline information posted within individual ads. Our target demographic is primarily young buyers. Our research shows that the gender of a typical user is very evenly split and is more likely that this user has some college education or a college degree. According to demographic research, a majority of site visitors also visit e-commerce websites such as ebay.com, amazon.com, zillow.com, and indeed.com. This indicates to us that our users are interested in purchasing various products including homes, cars, and more. Craigslist will focus on streamlining product information through product templates to create cohesion from post to post. This will create an informational hierarchy so users can find the product information they need quickly and efficiently. 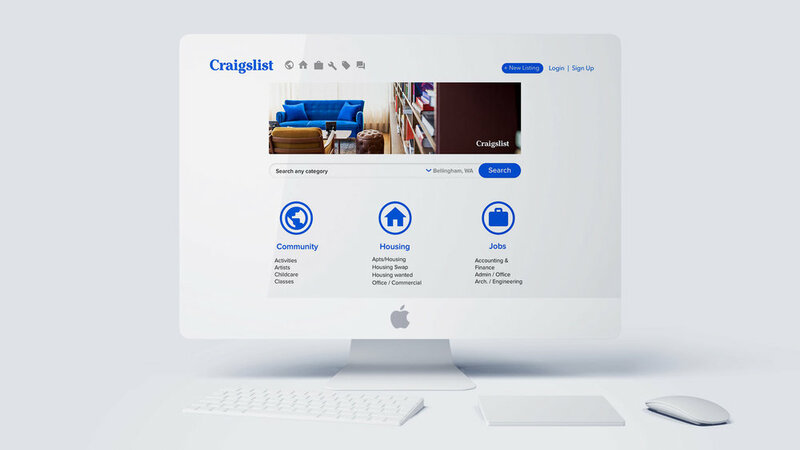 Craigslist will establish a user profile system equipped with user ratings, reviews, buy-and-seller history, and a Craigslist user verification. This will establish user’s trust between buyers and sellers, and also Craigslist as a brand..
Craigslist will implement a profile-to-profile messaging system that will allow the users to directly message one another without having to use their personal phone numbers or emails. This will standardize the types of messaging that the users will engage in. The Craigslist aesthetic which is currently simple and dated, shall be updated to a more modern, contemporary web layout, while maintaining its core functions. 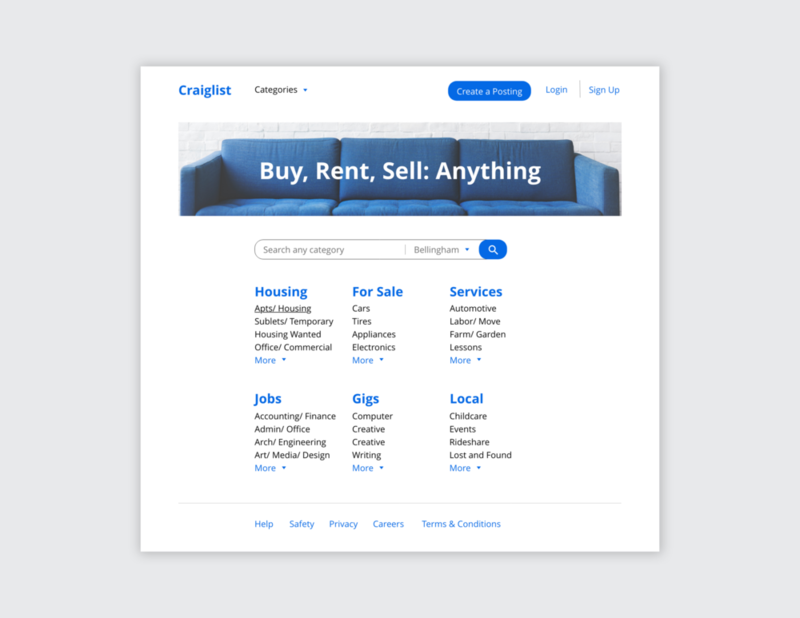 Craigslist will establish trust through the standardization of visual and graphic elements such as typefaces, icons and promotional materials. 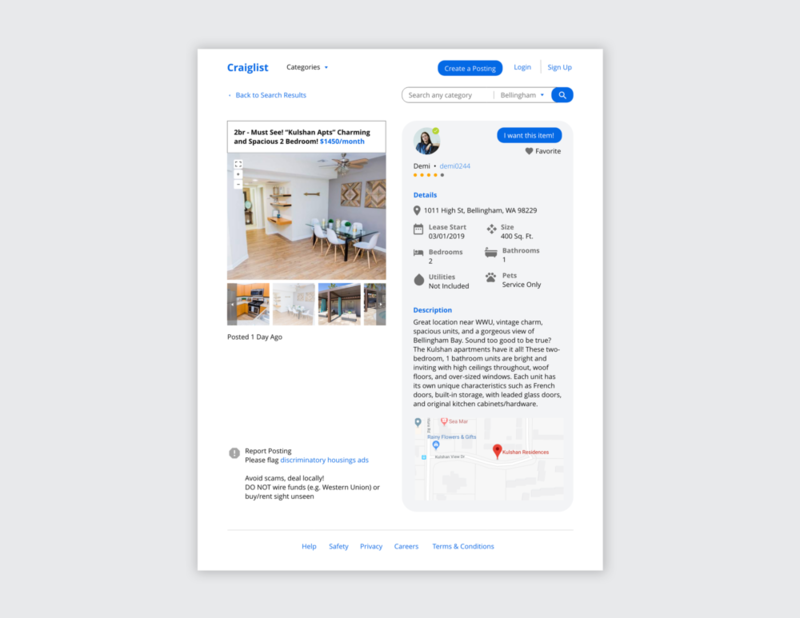 Craigslist will reduce the amount of visual noise through the clustering of information by using sub navigation bars, sliders and drop down menus. Find information about products I’m interested in quickly and easily. Be able to contact seller/buyer easily through messaging system. No weird email links. Less waiting time for response. Be able to verify if the user is legit through quick scan of profile, being able to view reviews, ratings, and verification logo. For our primary research, we have used three methods to gather more information about the user: SurveyMonkey, ethnographic observations, and in-person interviews. These methods were used to primarily search for the user habits and reasons people use the website. For example, users were asked how often they visit the website and what do they use the website for. From these methods, we have found that people more frequently use Craigslist to search for home, apartments, and furniture (63.6%) and that people only sometimes visit the website throughout the last six months (49.1%). We have also found that many people use Craigslist to only browse options, but very rarely turn browsing into buying (41.8%). This was due to user trust of the seller. From this finding, we wanted to focus our redesign on building that user trust. To do that, we created the profile system and in-desktop messaging. Much of the paper prototype feedback comments regarded micro-details that were overlooked, but fairly important to the user flow that we might have missed. For example, through the filter system of the ads, we lacked price and location filters. For our verification, we failed to clarify the purpose of verification and how it benefited the users, which affected the overall motivation to use verification. Other important feedback received regarded ad post clarification, more specifically including words with icons to more clearly define section options for posters. Posts should be ultra specific and clear to the user what they are getting. Most importantly, many people commented on the importance of keeping the interface simple, like the current interface. Hence, the redesign should refresh, but not move too far away from Craigslist’s true intentions. Once people have to start digesting more design, then that is the point where we have over-designed the product. Throughout this whole process, we have found that people love the profile aspect of the redesign, and are willing to create profiles to streamline the way they interact and communicate with other users. In-desktop messaging centralizes communication, which makes it easier for users to trust other users. As far as utilizing verification to provide trust, we have found that people don’t hate that option, however the user does need to be educated in detail about the purpose of verification and how it benefits them. Verification, in-general, might change Craigslist’s entity of simple browsing, casualness, and anonymity, so it is important to research more methodologies regarding verification. The option of skipping verification was important, because it gave users the control that users want and need. Hierarchy created within individual posts was overall helpful. This made it easier for highlighted information to be recognized by users, and the amount of time it took to learn about postings was decreased, making it faster as well.